In the same week I was told to things that at first seemed unrelated, but were really about our expectations of God. The person saying it was well-meaning, but he was talking about making money and was trying to be encouraging to tell me that I should be better off financially than I am. I didn’t know how to respond. The second was about someone else, but told to me. It was about a man who was very angry with God because his children had moved away and he had gotten ill. He prayed and prayed that his kids would move back and that his health would be restored, but wasn’t getting the answers he wanted in either area. He thought he deserved better; he’d been told that if he trusted God he would prosper and to him that meant he should be healthy and his kids should be around. The person telling me this story asked how he should respond to his friend. What does it mean to prosper according to the Bible? Sadly, situations like this are very common. They have been from the time Job was written when his friends falsely accused him of sinning because in their thinking the only reason for a person to undergo the trials he was experiencing was because of sin. It never occurred to them that God considered Job a very godly man and that he was honoring him before the hosts of heaven with the trials he was given. Clearly, humanity has problem with what it means to prosper in God’ eyes. This week you will finish up Job and then pick back up again with the story of Abraham. Next week I’ll have more on Abraham and how different the Muslim view is of him. When people talk about both Islam and Christianity having a common father in Abraham, you’ll see that the only thing in common is the name—they are talking about a very different person. Only the Christian view of Abraham can be historically verified. To go back a bit in Genesis. . . .
As you finish reading Job this week, take some time to think through if you have fallen into the false belief that in this life you are promised only good things. Journal where you have had wrong beliefs along the way and how after reading Job, how God wants you to look at difficulties. We will all have a happy ending to our story, but like any good adventure story (think about the Hobbit, Lord of the Rings, or Star Wars or any great adventure) there were always challenges along the way. For some we get a taste of the good ending in this life; for others we wait to see it in its fullness, where it will be far more glorious than our feeble dreams can imagine. The book of Job is one of the most challenging books in the Bible, in part because of extensive disagreement about the book among commentators. Though any Google search will acquaint you with the controversies, after reading many of them, cross referencing and studying them in detail , I believe the excerpt below most clearly and accurately provides an introduction to the book. The most likely person who placed the book into the scriptures was Moses, though this does not equate Moses as the author of the book. All of these conclusions are debated and though these are areas that we can certainly debate without division, I found that many of the authors who disagree with the above statements did so, not because of what seems to me to be clear historical and textual evidence, but because of anti-supernatural presuppositions: that Job has to be an allegory because Satan couldn’t have really done that or that Job couldn’t have really experienced his troubles by God’s intention and permission and so it much be an instructive tale without a basis in real life. Job a Real Person. — It has been supposed by some that the book of Job is an allegory, not a real narrative, on account of the artificial character of many of its statements. Thus the sacred numbers, three and seven, often occur. He had seven thousand sheep, seven sons, both before and after his trials; his three friends sit down with him seven days and seven nights; both before and after his trials he had three daughters. So also the number and form of the speeches of the several speakers seem to be artificial. The name of Job, too, is derived from an Arabic word signifying repentance. But Ezekiel 14:14 (compare Ezekiel 14:16, Ezekiel 14:20) speaks of “Job” in conjunction with “Noah and Daniel,” real persons. St. James (James 5:11) also refers to Job as an example of “patience,” which he would not have been likely to do had Job been only a fictitious person. Also the names of persons and places are specified with a particularity not to be looked for in an allegory. As to the exact doubling of his possessions after his restoration, no doubt the round number is given for the exact number, as the latter approached near the former; this is often done in undoubtedly historical books. As to the studied number and form of the speeches, it seems likely that the arguments were substantially those which appear in the book, but that the studied and poetic form was given by Job himself, guided by the Holy Spirit. He lived one hundred and forty years after his trials, and nothing would be more natural than that he should, at his leisure, mould into a perfect form the arguments used in the momentous debate, for the instruction of the Church in all ages. Probably, too, the debate itself occupied several sittings; and the number of speeches assigned to each was arranged by preconcerted agreement, and each was allowed the interval of a day or more to prepare carefully his speech and replies; this will account for the speakers bringing forward their arguments in regular series, no one speaking out of his turn. As to the name Job – repentance (supposing the derivation correct) – it was common in old times to give a name from circumstances which occurred at an advanced period of life, and this is no argument against the reality of the person. Where Job Lived. — “Uz,” according to Gesenius, means a light, sandy soil, and was in the north of Arabia-Deserta, between Palestine and the Euphrates, called by Ptolemy (Geography, 19) Ausitai orAisitai. In Genesis 10:23; Genesis 22:21; Genesis 36:28; and 1 Chronicles 1:17, 1 Chronicles 1:42, it is the name of a man. In Jeremiah 25:20; Lamentations 4:21; and Job 1:1, it is a country. Uz, in Genesis 22:21, is said to be the son of Nahor, brother of Abraham – a different person from the one mentioned (Genesis 10:23), a grandson of Shem. The probability is that the country took its name from the latter of the two; for this one was the son of Aram, from whom the Arameans take their name, and these dwelt in Mesopotamia, between the rivers Euphrates and Tigris. Compare as to the dwelling of the sons of Shem in Genesis 10:30, “a mount of the East,” answering to “men of the East” (Job 1:3). Rawlinson, in his deciphering of the Assyrian inscriptions, states that “Uz is the prevailing name of the country at the mouth of the Euphrates.” It is probable that Eliphaz the Temanite and the Sabeans dwelt in that quarter; and we know that the Chaldeans resided there, and not near Idumea, which some identify with Uz. The tornado from “the wilderness” (Job 1:19) agrees with the view of it being Arabia-Deserta. Job (Job 1:3) is called “the greatest of the men of the East”; but Idumea was not east, but south of Palestine: therefore in Scripture language, the phrase cannot apply to that country, but probably refers to the north of Arabia-Deserta, between Palestine, Idumea, and the Euphrates. So the Arabs still show in the Houran a place called Uz as the residence of Job. 1. Job‘s length of life is patriarchal, two hundred years. 2. He alludes only to the earliest form of idolatry, namely, the worship of the sun, moon, and heavenly hosts (called Saba, whence arises the title “Lord of Sabaoth,” as opposed to Sabeanism) (Job 31:26-28). 3. The number of oxen and rams sacrificed, seven, as in the case of Balaam. God would not have sanctioned this after the giving of the Mosaic law, though He might graciously accommodate Himself to existing customs before the law. 4. The language of Job is Hebrew, interspersed occasionally with Syriac and Arabic expressions, implying a time when all the Shemitic tribes spoke one common tongue and had not branched into different dialects, Hebrew, Syriac, and Arabic. 6. There is no allusion to the exodus from Egypt and to the miracles that accompanied it; nor to the destruction of Sodom and Gomorrah (Patrick, however, thinks there is); though there is to the Flood (Job 22:17); and these events, happening in Job‘s vicinity, would have been striking illustrations of the argument for God‘s interposition in destroying the wicked and vindicating the righteous, had Job and his friends known of them. Nor is there any undoubted reference to the Jewish law, ritual, and priesthood. 7. The religion of Job is that which prevailed among the patriarchs previous to the law; sacrifices performed by the head of the family; no officiating priesthood, temple, or consecrated altar. The Writer. — All the foregoing facts accord with Job himself having been the author. The style of thought, imagery, and manners, are such as we should look for in the work of an Arabian emir. There is precisely that degree of knowledge of primitive tradition (see Job 31:33, as to Adam) which was universally spread abroad in the days of Noah and Abraham, and which was subsequently embodied in the early chapters of Genesis. Job, in his speeches, shows that he was much more competent to compose the work than Elihu, to whom Lightfoot attributes it. The style forbids its being attributed to Moses, to whom its composition is by some attributed, “whilst he was among the Midianites, about 1520 b.c.” But the fact, that it, though not a Jewish book, appears among the Hebrew sacred writings, makes it likely that it came to the knowledge of Moses during the forty years which he passed in parts of Arabia, chiefly near Horeb; and that he, by divine guidance, introduced it as a sacred writing to the Israelites, to whom, in their affliction, the patience and restoration of Job were calculated to be a lesson of especial utility. That it is inspired appears from the fact that Paul (1 Corinthians 3:19) quotes it (Job 5:13) with the formula, “It is written.” Our Savior, too Matthew 24:28), plainly refers to Job 29:1-25:30. Compare also James 4:10 and 1 Peter 5:6 with Job 22:29; Romans 11:34, Romans 11:35 with Job 15:8. It is probably the oldest book in the world. It stands among the Hagiographa in the threefold division of Scripture into the Law, the Prophets, and the Hagiographa (“Psalms,” Luke 24:44). Design of the Book. — It is a public debate in poetic form on an important question concerning the divine government; moreover the prologue and epilogue, which are in prose, shed the interest of a living history over the debate, which would otherwise be but a contest of abstract reasonings. To each speaker of the three friends three speeches are assigned. Job having no one to stand by him is allowed to reply to each speech of each of the three. Eliphaz, as the oldest, leads the way. Zophar, at his third turn, failed to speak, thus virtually owning himself overcome (Job 27:1-23). Therefore Job continued his reply, which forms three speeches (Job 26:1-14; Job 27:1-23; Job 28:1-28; 29:1-31:40). Elihu (Job 32:1-37:24) is allowed four speeches. Jehovah makes three addresses (Job 38:1-41:34). Thus, throughout there is a tripartite division. The whole is divided into three parts – the prologue, poem proper, and epilogue. The poem, into three – (1) The dispute of Job and his three friends; (2) The address of Elihu; (3) The address of God. There are three series in the controversy, and in the same order. The epilogue (Job 42:1-17) also is threefold; Job‘s justification, reconciliation with his friends, restoration. The speakers also in their successive speeches regularly advance from less to greater vehemence. With all this artificial composition, everything seems easy and natural. Jamieson, Robert, D.D. ; Fausset, A. R.; Brown, David. “Commentary on Job Overview”. “Commentary Critical and Explanatory on the Whole Bible”. “http://www.studylight.org/commentaries/jfb/view.cgi?book=job&chapter=000”. 1871-8. We sometimes make fun of people who turn to the back of a novel to find out the end of the story before reading the book. Though that may spoil the suspense for some books, the book of Job is one that knowing the end of the story is essential for the book to make sense and for you to apply its truths correctly. Job 42:7 After the LORD had said these things to Job, he said to Eliphaz the Temanite, “I am angry with you and your two friends, because you have not spoken the truth about me, as my servant Job has. 8 So now take seven bulls and seven rams and go to my servant Job and sacrifice a burnt offering for yourselves. My servant Job will pray for you, and I will accept his prayer and not deal with you according to your folly. Asking questions seems to an intrinsic part of what it means to be human. From children’s perpetual “What’s this?” “Why?” “Why not?” to the philosopher’s “Where did we come from?” “Why are we here?” “Is there any purpose to our existence?” questions fill our minds. If we are a Christ-follower, the questions don’t necessarily stop. In reality they often become more complex when our everyday experience of the Christian life does not line up with our expectations of what it is supposed to be. Much of the modern religious message is that if you are a Christian, tithe, and vote the right way, life will be wonderful, you’ll have plenty of money and never get sick. Sounds great and those rules are easy to follow. Well, maybe the tithing isn’t—but if you are above a certain income level, a tithe is far from a sacrificial part of your income and you can congratulate yourself by giving it and rationalize you don’t need to give more. Few churches today would challenge you on that assumption. But what happens when reality intrudes and you lose your job, health, or a loved one? You assumed you followed all the rules. It seems like God didn’t keep his part of the bargain. At these times the questions without easy answers bubble up. Where do we find answers? These are the first two books of the Bible that we are reading in our chronological reading through the Bible in a year. In this video we’ll talk about why we read Job in the middle of Genesis and how these two books help answer some of the big questions of life. If you want to just listen to the audio, it will make sense without having to look at the images. CLICK on the image to download the notes that go along with the video. 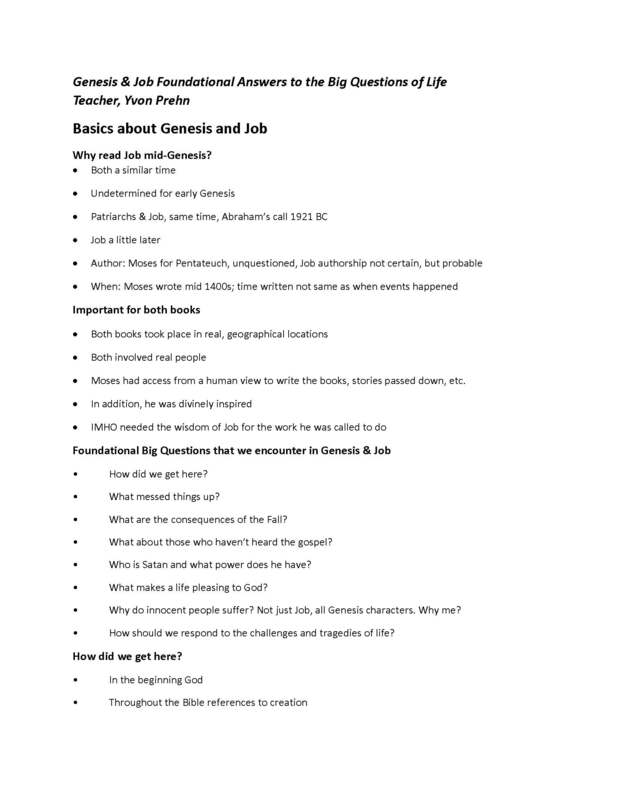 Anyone may use and copy them for any Bible teaching situation. Click on the image to download a PDF of the NOTES and DISCUSSION QUESTIONS for this video. Please sign up for the newsletter (CLICK HERE)so you’ll be notified when I post commentary and lessons on the readings as we go along.